Question: I have 3 yellow knockout rose bushes that I planted 2 springs ago at our leased home and now we are moving. We reside in the Raleigh NC area and weather has turned back to very comfortable for this past week, and will be reaching upwards of 75 for the next few days. I am pondering digging these up to move them with us. We do not close until the end of December and will be slowly moving during the whole month of January. Weather conditions unknown, of course, but certainly more wintery than current conditions. What is the best way to go about this - do I dig them up and replant in a large enough pot, to bring them inside until next spring, or do I create "bare root" stock and go that route. Do I prune them back extensively or wait? They are roughly 10-gal sized! K.C. : Yes you may dig out your Knock Outs. I would cut them back to around 15-18 inches. If you can manage a container big enough I would dig out with soil ball around the roots and place in the pots. Then they need to be stored cold, either outside or in a cold garage or crawl space. They can freeze. DO NOT bring into the warm house. Then I would keep them stored cold after moving and plant them in spring. K.C. : Hi Kittie, you can start the sunflowers in the house , and then transplant to outside towards the end of May, and you should still have flowers for the Oct. Wedding, though they will prettiest in September, depending on weather. Worse comes to worse, you can always buy sunflowers around here then. Lemon trees are not in my expertise really, but dropping leaves is normal in a three season room. Keep it watered, and fertilize as soon as you see growth buds forming. I would call Bristols in Victor for better info on lemon trees, they have the best selection of tropicals in this area. K.C. : Hi Seth, that's VERY interesting. the weather this year has caused many unusual plant events. Since Jacks go dormant in the heat of the summer, they then only have the soil temperature to go by. So it rained alot in September, then got sort of cold, then we have this warm November. 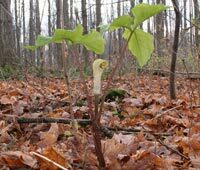 Once the leaves start to sprout the plant then has day length for signals, and of course, jacks have short days like this in the Spring, so there you have it! A confused Jack! Question: I live in a condo and I love to feed the birds that fly around outside me home. I love to see them eat and enjoy themselves. My question is this, several times now, three to be exact, the birds fly in to my home to die. I am puzzled as to why. Would you happen to know why? My friend says it is a bad omen but I don't believe that. - T.M. K.C. : Hi Terri, no bad omens here---the birds are simply confused by the reflections in windows. There are products you can use that are effective for preventing this. Droll Yankee is a company that sells a decal of sorts to put on your windows. It looks like a spider's web. Spiders weave a white center section in their webs to ward off birds from destroying their webs. These decals have that pattern, and it works, I've used them myself. K.C. : Sorry to say it is too late for Dahlias, they are a tuber that has to be stored in winter in our area. You could try cutting off any growth that may have come on them and store them this winter in a cool dark place, wrap them in a little peat moss (not moist) and newspaper. Do not let them be below 40 degrees. The other bulbs you are talking about---I'm assuming they are also summer bulbs like glads or something, let me know what they are and we can discuss further. Fall is the time to plant tulips and daffodils. So maybe take your gardening energy and time toward that, and enjoy the show in the spring. K.C. : You can trim your holly bush now, or even wait until closer to christmas if you want the berries to be fresher. Only trim it about 1/3 down or 1/2 being sure to leave planty of leafy branches. Never trim it down to bare areas. If you live in our area I have two classes coming up about winter pruning. what I would do, rather than have everything destroyed or landscape with the plants on the resistant list only to find out that they aren't. Only plant I know of is Daffodils, nothing will eat them because they are poisonous. K.C. : Everything that I have read about this would indicate that it is NOT a good idea. My best recommendation for mulching is cocoa shells, or composted leaves. I prefer not to use wood mulch because it depletes the soil of nitrogen. The coal by-product would not be anything beneficial, and might be harmful.